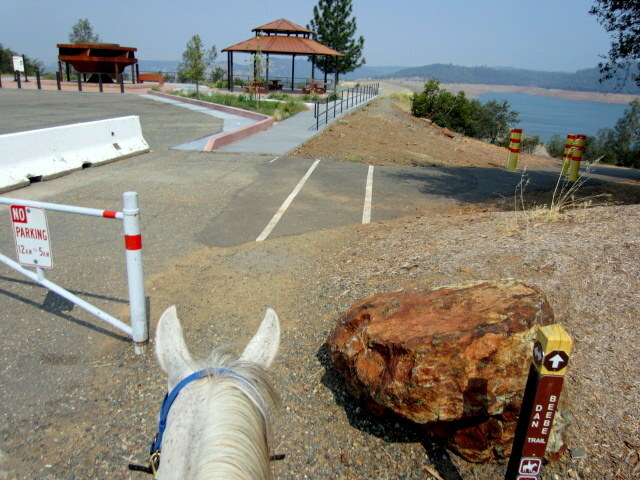 Temperatures finally cooled today and N and I had a chance to meet at Lake Oroville for a morning ride. There was inexplicable, fairly heavy smoke over the lake and enough smoke for pretty decreased visibility over the valley. The air didn’t smell smoky and neither of us were aware of a wild fire. You can sort of see the grey tinge in the sky over the lake in the photo below. Also pictured, the spooky horsey obstacle course. Fortunately Scrappy isn’t very spooky and just slowly walks past this sort of madness with his head low, snorting softly. We rode about 13 miles and took Scrappy up Sycamore Hill for the first time. 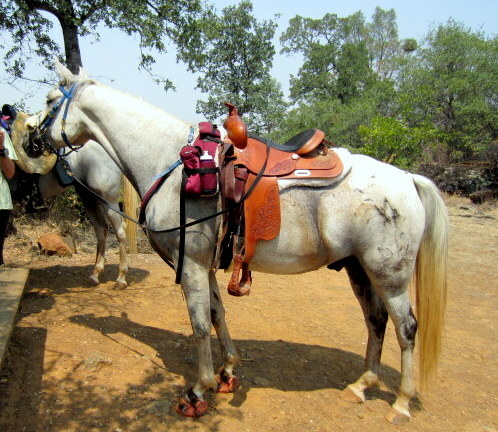 He picked up a slow jog of his own accord as we headed up and motored nicely on a loose rein except where I slowed him on a few really rocky parts. I am still riding him with front Renegades and barefoot in the hind as I focus my experimenting on figuring out saddle/girth issues, but will eventually have to work him in hind boots too. He is moving well with the hinds bare but gives a few ouchy steps on rocks per ride and at speed I’d like his hinds protected for more miles. Today’s tack testing included a new fleecy girth and a fleecy noseband cover. I Desitin-ed Scrappy’s armpits just to be safe, and the fleecy girth didn’t give him those weird lumps or rub any hair or skin off, woohoo! Also got a great, even sweat mark with the Woolback and western Abetta again, with not even the bat of an eye on back palpitation. I noticed the S-hack rubbed some hair off his nose last time and the fleecy noseband cover remedied that issue nicely today. We did a fair amount of relatively steep up and down riding today and the saddle didn’t seem to slide at all. I’m amazed how well that small Woolback keeps saddles in place with no keeper straps at all! Willow and Scrappy rode well together today again, despite Willow being in heat and Scrappy getting a bit dangly in the male regions at the start of the ride. There was no funny business or squealing, though Scrappy did neatly cut Willow off on-trail approximately 85 times. He doesn’t like to ride side by side it seems, when we come alongside a horse he gets sort of shifty and nervous and either stops dead and tucks in behind the horse or speeds up and neatly cuts them off. Interesting and maybe something learned from his young life growing up in the Rushcreek herd? 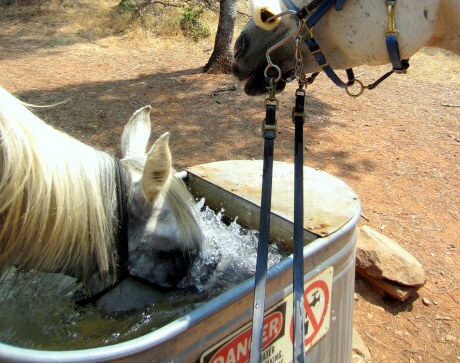 Still, the horses got along fine and both snacked and drank well. Scrappy drank from a stream that we have always joked about being Off or “poisoned” as horses will sniff it but never drink it, and by appearances it’s quite a nice, running stream. He also stopped along the trail to drink from a little ditch barely wide and deep enough to get his nose in. Great survival skills there but I did notice that he didn’t pee until he was turned out at home, and it wasn’t as much pee as I expected considering he drank 4 or 5 times on the ride. He eats and drinks and poops (and farts!) copiously on the trail but doesn’t seem to pee very much. I think I am happy with my tack on the Scrapster, for the most part. He is going great in the S-hack and Renegades, and the pad, girth, and saddle passed muster today. I may still get a crouper and teach him about that to have it in our arsenal, though my Abetta doesn’t seem to be sliding so far. The saddle needs some tweaking for my benefit, namely rigging some endurance stirrups on and putting a full saddle fleece on it, since my feet hate me right now after the hard leather stirrups and I rubbed quarter sized raw spots on my inner thighs where a seam in the saddle was. I’m also still liking my idea of sawing off the horn menace on the pommel. I do like leaning on it and singing cow poke tunes but I ride in fear of knocking or catching myself on it. I’ve done both and neither are fun. 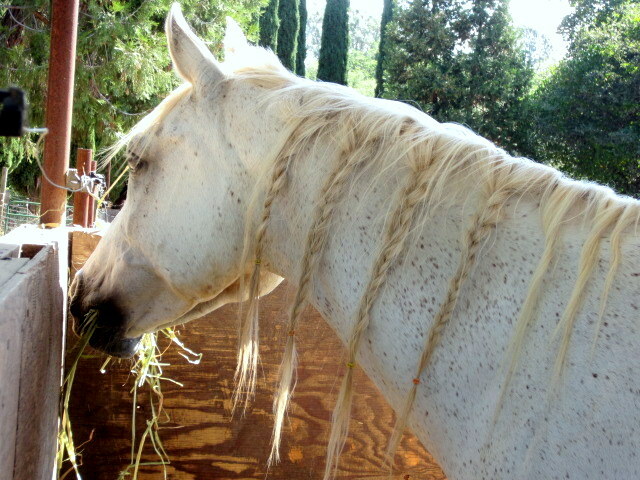 In other news, here is my lovely miss Desire enjoying breakfast the other morning. I rode her out the other day hoping to feel improvement after her hind hock injections but she was no sounder than before the injections, unfortunately. The quest continues.. Here is this year’s giant pumpkin patch. 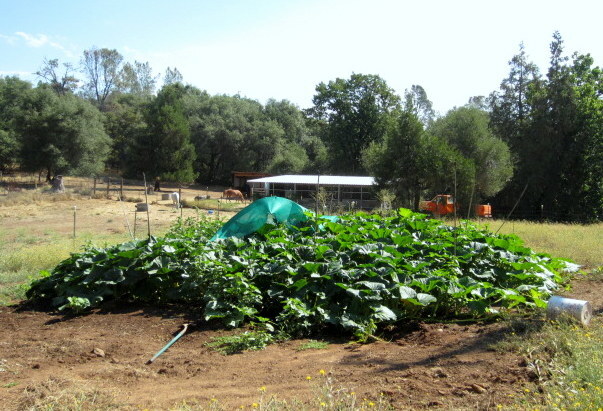 The 2 pumpkin plants were planted under that little green tent in the middle, in the beginning of June. They have grown a bit! And finally, here is my computer helper, Rip, who is now 10 months old. 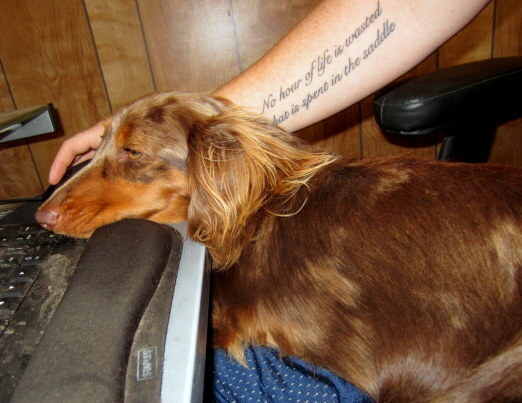 He is an accomplished lap warmer and occasional assistant typist. 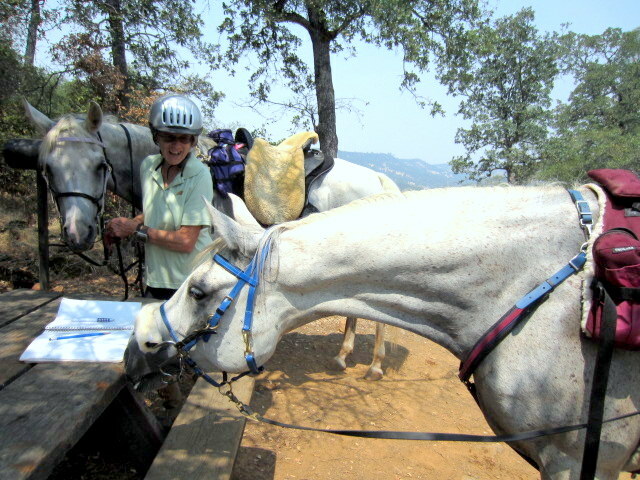 I replaced the noseband on my s-hack with one of the beta nosebands…this is just one example, most of the biothane tack-makers will do them these days: http://www.hought.com/end.s.hackamore2nb.html. No rubs, and doesn't pick up as much stuff as a fleecey cover. And I would heartily recommend sawing off the horn on the saddle and you should be good to go! I did that on my old gymkhana saddle that was one of my early endurance saddles and it worked great! you need hind protection because that is where the drive is. I know most feel that the fronts are the most important to protect. But in actuality both need protection. Fronts because that is where they carry most weight. But hinds because that is your drive, if they get “ouchy” then they will pull with the front and not drive with the hinds. With some leaving the fronts bare & protecting the hinds will help them pay attention to where they place their fronts. Regarding the fronts, once tender, as long as there is hind protection, they will pick up their hooves better and start carrying better on the hind end. But then you are at risk for stone bruises. Regarding fluffy nose band. 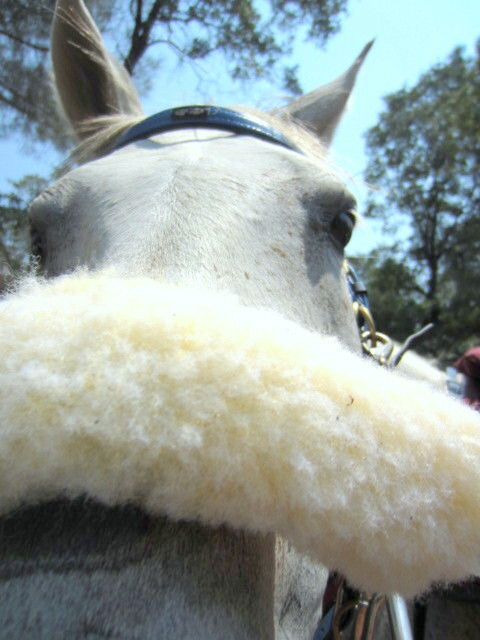 You need to trim the edges so that the fluffy is just covering the nose. They can't see below very well because the fluffy impedes their vision. “washing her eyeballs” bahaha. What a goofball!